T0553 Magenta x 3, T0554Yellow x 3. T0553 Magenta x 2, T0554Yellow x 2. The Epson Stylus Photo RX520 is designed to cater the need of new digital camera users who want high-quality photo prints. It is a classy printer that offers photo-lab printing, scanning and copying facilities with economical price. The printer uses individual Epson Stylus Photo RX520 ink cartridges, and user needs to replace the one that has run out. This feature helps users to decrease their printing cost. This RX520 features with colour LCD display, for adjusting photos and getting access to many functions easily, PictBridge port for direct printing without connecting to the computer, and Integrated transparency unit for scanning from the slides. However, the printer does not provide wireless connectivity and fax feature. This classy printer looks smart and stylish and adds on to the look of your mini office. It weighs merely 7.8 kgs. The dimension of the Epson Stylus Photo RX520 is 7.8 (Height) x 17 (Width) x 16.3 (Depth) inches. The maximum printing resolution is up to 5760 x 1440 dpi for mono and 5760 x 1440 dpi for color. While the printing speed is up to 20 ppm for mono and 19 ppm for color. A set of four Epson Stylus Photo RX520 ink cartridges comes with this printer. The Epson Stylus Photo RX520 is ideal for new digital camera users, who are looking for high-quality prints at fast speed. It has some exciting features like PictBridge, LCD display, transparency and slide-scanning. No wireless and fax features are major drawbacks of this printer. Q. Can you deliver Epson Stylus Photo RX520 ink cartridges in Dublin? A. Yes, we deliver our products to all areas of Republic of Ireland and Northern Ireland. Q. What are the physical dimensions of Epson Stylus Photo RX520? A. The dimensions of Epson Stylus Photo RX520 are: 432 mm (Width) x 413 (Depth) x 201 mm (Height). It weighs around 7.8 kg. Q. Do Epson Stylus Photo RX520 ink cartridges dry up if not frequently used? A. Any cartridge whether original or compatible would dry up if it is not used for a long time. It is advisable to use the printer at least once every month to ensure the flawless working of it. Q. Are there any precautions to be kept in mind while handling Epson Stylus Photo RX520 ink cartridges? When an ink cartridge is empty, you cannot continue copying or printing even if the other cartridges still contain ink. Leave the empty cartridge installed in the printer until you have obtained a replacement. Otherwise the ink remaining in the print nozzles may dry out. If ink gets on your hands, wash them thoroughly with soap and water. If ink get in your eyes, flush them immediately with water. If you still have discomfort or vision problems, see a doctor immediately. Q. Does the Epson Stylus Photo RX520 printer comply with ENERGY STAR? A. As an ENERGY STAR partner, EPSON has determined that this printer meets the ENERGY STAR guidelines for energy efficiency. Q. Do your compatible Epson Stylus Photo RX520 ink cartridges come with warranty? Q. What is the optical scanning resolution of Epson Stylus Photo RX520? A. Epson WorkForce WF-3640 has an optical scanning resolution of 1200 x 2400 dpi (Dots per inch). Q. What makes Epson Stylus Photo RX520 printer a popular choice for photo printing amongst users? A. The Epson Stylus Photo RX520 is an all-in-one home photo centre, designed for the users who want high-quality photo prints. 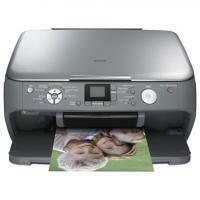 It is a classy printer that produces Photo-lab quality prints so quickly and easily. It offers scanning and copying facilities with economical price and can restore old and faded photos at the touch of a button. Q. Are these compatible or original Epson Stylus Photo RX520 ink cartridges? A. We sell both the original as well as compatible ink cartridges above on this site. You can differentiate between the original and compatible by looking at the manufacturer logo under the image of each product. The original will be shown in the original Epson packaging and the compatible Epson Stylus Photo RX520 ink cartridges will be labeled as “Premium Brand” under the cartridge image. Q. What is the print resolution of Epson Stylus Photo RX520? Can I print high definition photos from this printer? A. Epson Stylus Photo RX520 has a print resolution of 5760 x 1440 dpi for mono and 5760 x 1440 dpi for colour, thus can print extremely high quality and fine photos in less time. One can use this printer for printing professional as well as daily use photos. Q. I own an Epson Stylus Photo RX520 printer which has started making weird image printouts with disturbed colour contrast. I observe that there are some uneven lines on the printouts and the colours are also missing. Can you help me fix this problem? A. There are very common issues one will get with the Epson Stylus printers. You can check for the printhead nozzles by using a Nozzle check utility on your computer, this will determine if any of the nozzles are clogged. You should also check the purchase date of these Epson Stylus Photo RX520 ink cartridges as if they were bought long ago then, could have started drying and producing printouts with low quality.